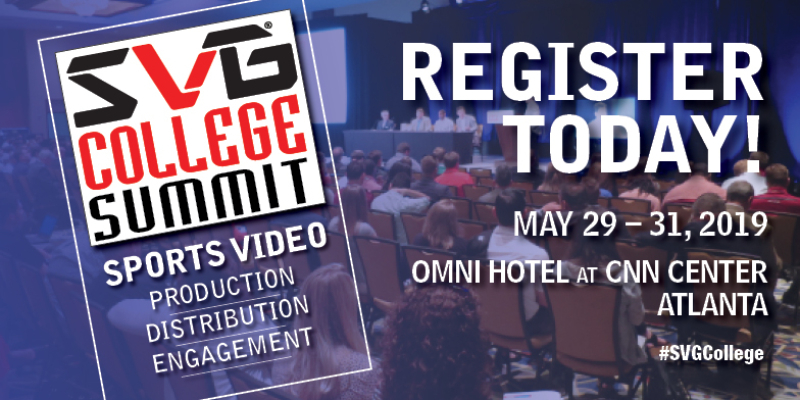 In just over two months, the collegiate athletics-video community will again convene in Atlanta for the 11th-annual SVG College Summit (May 29-31, Omni Hotel at CNN Center). It’s the premiere professional networking and development conference in the business, and this year’s agenda is already shaping up to be one of the most exciting and diverse yet. Last year’s event drew a record attendance of more than 600 people representing more than 100 athletic departments and conference offices. This year’s crowd promises to be even larger. And don’t forget, if you work for an athletic department, conference office, or broadcast entity, attendance at the SVG College Summit is FREE! In August, the highly anticipated ACC Network will launch, with a long and comprehensive buildout of on-campus media-production facilities completed by many of the Atlantic Coast Conference’s 15 institutions. Millions were spent on cameras, switchers, replay devices, graphics engines, comms, fiber, and much more. What have these institutions learned during this challenging process, and what advice would they give to others looking to enhance their own internal video-production operations? Find out in this session that opens the main stage on Thursday, May 30. On the morning of Friday, May 31, the SVG College Summit will have a much different feel, placing a hyper focus on the burgeoning world of esports. From the operational requirements to the creative storytelling techniques behind some of the biggest esports, attendees will receive a concentrated look at how some of the top esports brands put together their live-streaming productions and receive advice on how to enhance productions or build an operation from the ground up. Whether you currently produce esports events or will have to start doing so soon, this morning of tutorials will prove invaluable to you. Get an exclusive look behind the scenes of Georgia Tech’s new video-production facility, built for the upcoming launch of the ACC Network. See the latest in control-room and video operations with a tour of this multimillion-dollar building. The tour will take place at approximately 1 p.m. on Wednesday, May 29. Details on registering for this special event will come at a later date and is available only to attendees of the SVG College Summit. Looking to take your live event productions to the next level? Former Head of Content/ Executive Producer, Under Armour and Red Bull Media House and former Turner Sports Producer/Director Megan Wells and multiple Sports Emmy Award-winning cinematographer/DP Tom Wells will give a high-level overview of how to get inside the minds of your audiences, give them a unique visual experience, and connect with them emotionally so that they keep coming back to your content and your platform. From lens choice to camera placement to carefully considering demographics and audience motivation, the owners of Two Birds Films and Technician Films will share learnings from more than 20 years in sports production working with such clients as Fox Sports, MLB, Super Bowl, NBA, Red Bull, Under Armour, and The Olympics. Work in live sports production long enough and you’ll learn to expect the unexpected. From inclement weather to wonky venues, producers of live sports video have tackled some of the wackiest and most challenging obstacles with the belief that the show must go on. In this fun — and maybe anxiety-causing! — discussion, experts in the field of live college sports production will share the production tools, workflows, and workarounds that have helped take their productions to the next level (or made sure they happened at all!). Our SVGW (formerly Women’s Sports Media Initiative) group is back at the SVG College Summit will a special networking event at 4 p.m. on Wednesday, May 29. The networking group aims to enhance the role of women in creation, production, and distribution of sports content. Members work for sports leagues, teams, television networks, technology companies, and startups and focus on the business and technology behind sports production. Attendees are invited to listen, learn, exchange ideas and best practices, and meet other women in the industry. Speakers TBA. This academic year, The Ivy League shifted its media-production and -distribution strategy in a comprehensive agreement to broadcast more than 1,100 live events across more than 35 sports on the new ESPN+ direct-to-consumer platform. A year into that 10-year relationship, league and ESPN representatives will discuss the process leading up to launch, the successes and challenges in year one, and the priorities in the long-term plans of the partnership. This year’s main-stage agenda will be highlighted by a keynote conversation with Syracuse University Director of Athletics John Wildhack. With more than three decades in sports television and now sitting in an AD’s chair, Wildhack offers a deep understanding of where the college–sports-video landscape is, has been, and will be in the future. For more information regarding the SVG College Summit, visit www.svgcollege.com. If you have questions regarding the event, email Program Director Brandon Costa at [email protected]. If you are a technology vendor that would be interested in exhibiting at this year’s summit, email SVG’s Managing Director, Worldwide Sponsorship Development, Rob Payne at [email protected]. You can also follow the event on Twitter using @SVGCollege and #SVGCollege.